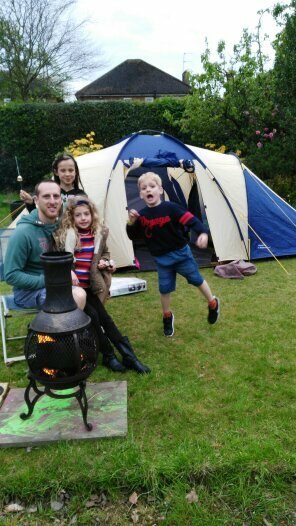 As a seasoned child camper I’ve been looking forward to taking F and R on their first real camp but after a couple of failed attempts, mainly due to me worrying about the weather, we finally had a successful go albeit in our back garden! We pitched up the tent which has been kept in storage for about 5 years and I found myself saying all the things my parents used to tell me such as “don’t jump over the guide ropes” and “stop bending the pegs”..Memories of my own family trips all came flooding back and even though part of me felt like we were cheating as we had the comforts of home just a few steps away it was lovely to spend so much time outside. When I was growing up with my four sisters and two brothers we would go to Anglesey in Wales every year and sleep in a giant green scout tent. It still makes me smile when I think about how we all lay across the tent in our different coloured sleeping bags, in age order. I’m amazed at how well behaved we were and that we actually slept. If I had 5 more Freya and Rory’s all in one tent I’m sure it would be absolute bedlam! For breakfast, we would eat dad’s famous porridge which he would meticulously cook to perfection over a burning fire. It tasted different eating it outside in an army style mess tin and I felt like I was a secret cadet on an expedition. 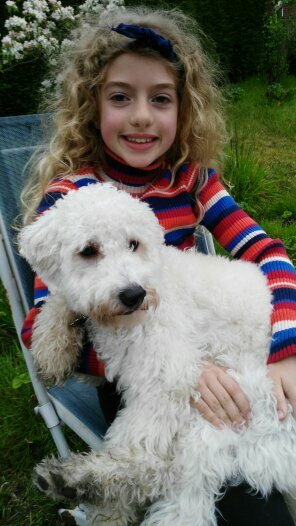 I also remember thinking it was a great novelty that I could sleep in a tracksuit rather than pyjamas. F’s eyes lit up when we told her we were going to camp, R on the other hand wasn’t too sure at first but soon warmed to the idea when the reality kicked in. 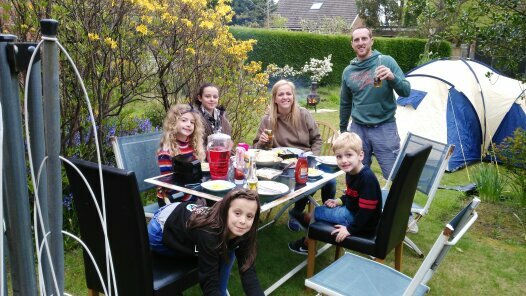 We had a barbecue and even toasted marshmallows on the chimnea that Tim’s parents gave us. R was the first to sleep and as soon as he was in his sleeping bag he curled up and was snoozing away. Although admittedly it wasn’t the best sleep I’ve had, in fact it was definitely one of the worst, surprisingly it hasn’t put me off. To add a bit more luxury to our first family camp we used the blow up bed which kindly decided to deflate throughout the night. I found myself clambering around the half deflated bed for most of the night and was convinced I would have a stiff back and neck in the morning. Thankfully I was ok but for our next trip I think I’ll go for some foam flooring rather than the blow up mattress. Camping at home is definitely the way forward but maybe after a few more tries we’ll brave it and venture further afield although I’m not sure I’ll ever be a “professional camper” like my parents.